A growing number of Japanese men nowadays can be seen taking part in community events with their children, an extended trend of a recent movement in which more men are becoming actively involved in child raising. Accompanying children to events makes it easier for these men, who otherwise tend to be preoccupied with their work, to form a network with other fathers in their own community. And it also contributes to establishing smooth relationships essential for mutual help in the event of trouble or emergencies, advocates say. 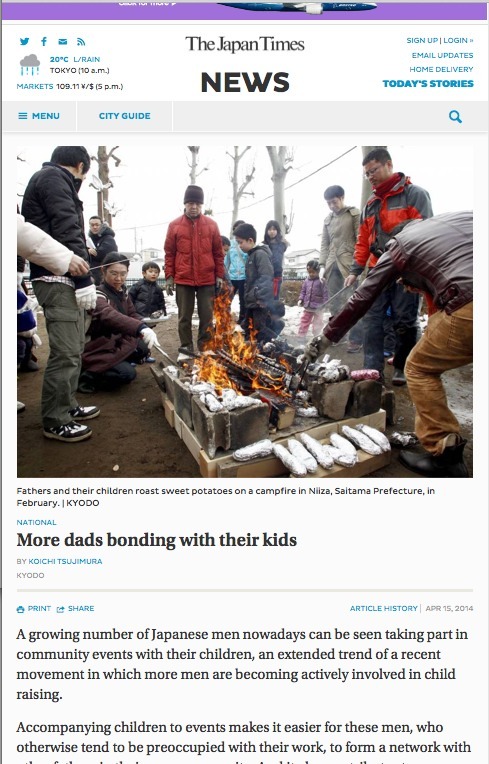 On a February holiday, about 90 kids and their fathers gathered at a park in the town of Niiza, Saitama Prefecture, for an event to roast sweet potatoes on a campfire. Fathers meeting for the first time greeted each other shyly as they prepared the fire. It was the second such gathering organized by 32-year-old Hiroki Sekido, the father of a 3-year-old boy. He said he had wanted to create opportunities for children and their parents to have fun in their communities. The first was held in December. Once Sekido brought in the necessary equipment and ingredients, there was no need for him to instruct other participating fathers, as each assumed their roles naturally — some added wood to the fire, others distributed the sweet potatoes. Shyness and any emotional barriers disappeared as everyone surrounded the campfire. “When engaging in a conversation with colleagues at work, you always have to consider each other’s interests. But with people in the local community, you can talk freely,” one participating father said. Another father said it was easy to strike up conversations with others as they were working together on something, such as making the fire or carrying out other preparations. “Fathers have the capability of leading children in games and play,” Sekido said of the positive response he has received so far. Sekido arranged the event with support from the nonprofit organization Hands On! Saitama, which advocates civic participation in community development. Between 2005 and 2013, the NPO helped organize similar potato-baking events at 580 locations, mainly in Saitama, gathering some 47,600 participants in total. “There are potentially many fathers out there who want to do something in their community or to make friends with other dads around,” said Tadashi Nishikawa, the NPO’s managing director. Such activities make for smooth relationships among local people, he said. Some community events for fathers even receive strong support from local authorities. Since fiscal 2010 the city of Yokkaichi in Mie Prefecture, for example, has been holding an annual course titled “Daddy Masters in Child-rearing.” At the classes, fathers don “empathy bellies” to simulate pregnancy, as well as learn to make snacks and how to play with kids. Participants from each course form their own interest group upon completing the classes and, in cooperation with the city, actively take part in local events for fathers. Advocates said it is important for fathers to devote themselves when taking part in such community networking events, where job titles do not matter and instead leadership and personal clout shine. “Fathers should play three roles all in one — not only are they career professionals but also members of the family and the community,” Atsumi said.